Hellboy is coming back to the big screen, and he's bringing some iconic creatures with him. The series is steeped in the supernatural and the mystical, but there will be a little bit of everything in the upcoming reboot for Hellboy to cut down. Actor David Harbour will bring the character to life this time around, and he's excited to take on a variety of creatures during his journey. "It was the hardest shoot I’ve ever done, primarily because there are just so many stunts in it," Harbour told Collider. "It’s a very action-packed movie. There’s a lot of story, too, and a lot of big scenes, but there’s a lot of action. There’s a lot of me running around, jumping and turning, and punching stuff. It’s crazy! I’m 42, and the fact that no one asked me to do this in my 20s is so insulting. Why did I have to become a super-monster in my 40s?! My bones are not the same as they used to be. It was very hard, in that way, but it’s also really thrilling ‘cause I get to carve out an entirely new mythos to this guy and I get to play on this big palette of witches and giants and demons." 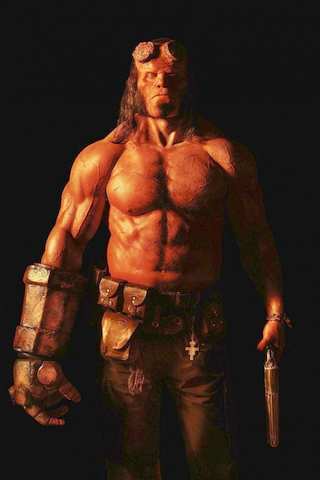 Those larger-than-life opponents are an integral element to what can be considered a Hellboy character study. "To me, it’s very Shakespearean," Harbour said. "I grew up doing regional Shakespeare and when Hamlet sees the ghost of his father, there’s something about that that you don’t really do in film anymore. We rarely see an indie film where you have an emotional pathos where somebody sees a ghost. This is a palette where you can have demons and ghosts and big creatures and things that are epic, in that way." Harbour will have the chance to explore the conflicted nature of the film's protagonist, a character who sits between the humanity he protects and the monsters he protects them from. "He’s a half-demon/half-man who’s lost in this world where he fights for human beings against monsters, so to speak, and yet he is part monster," Harbour said. "There’s a very interesting thematic kernel about a guy who’s lost and who doesn’t understand who he is, and he’s really struggling with that. That’s something that we play out in the movie, and that’s really exciting to me to play. You can have all the humor and all the action, and then you get to play this very deep, personal truth of feeling like you’re an outcast, or like you’re making the wrong decisions with your life and you’d like to turn that around. All those concepts and themes are things that I find very interesting." Hellboy is slated for release on January 11, 2019.